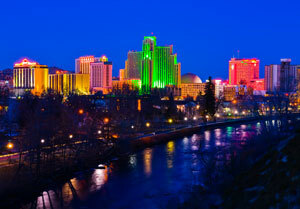 Reno is home to nearly 220,000 residents and is famously known as “The Biggest Little City in the World”. There are many effective advertising opportunities throughout the city including its famous casinos. Out-of-home advertisements or digital signage advertisements near casinos like the Silver Legacy Resort Casino and the Atlantis Casino. Target your audience with outdoor advertisements near the University of Nevada, Reno or Truckee Meadows Community College at competitive billboard rates. The major highways servicing Reno also provide billboard possibilities. Billboards on the Victoria Highway or the Lincoln Highway would generate high traffic exposure of your business.